Dr Kristin Bilyeu, a research molecular biologist from the United States Department of Agriculture Agricultural Research Services (USDA-ARS) Plant Genetics Research Unit at the University of Missouri specialising in molecular breeding of soybean recently visited UKZN’s Pietermaritzburg campus to present a seminar on her work. 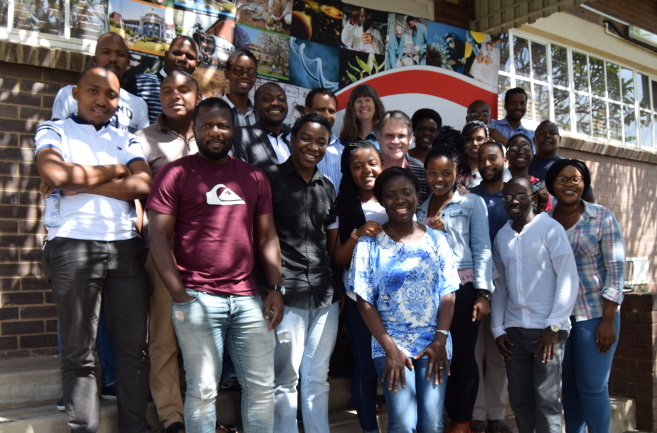 The seminar – which targeted postgraduate students and staff in Plant Breeding disciplines and programmes – was arranged by the African Centre for Crop Improvement (ACCI). More than 20 master’s and PhD students and staff from the ACCI and the Improved Masters in Cultivar Development in Africa (IMCDA) programme attended the event. ACCI’s Professor Hussein Shimelis thanked Bilyeu for visiting UKZN and sharing her knowledge and experience with staff and students. He highlighted opportunities for collaboration. ‘The goal is to make plant breeding more efficient so that it can deliver improved varieties of soybean in a short period of time, paying attention to biotic and abiotic stress tolerance and improved quality,’ said Shimelis. He noted Bilyeu’s valuable field and laboratory research and highlighted that shared aims were to develop improved varieties for increased food supply in the United States and developing countries. Bilyeu’s presentation involved the production of soybean – a legume domesticated in East Asia and now common worldwide – which is one of the USA’s major crops cultivated for vegetable oil and high protein animal feed production. She spoke about soybean as being part of a food solution since it is high yielding and adapted to many production environments. Her research, she explained, had been focused on creating a more functional soybean oil and improving the energy derived from the meal product. She has also begun to explore the expansion of soybean adaptation for high yield in more environments. Bilyeu explained her research process and objectives to give delegates insight into how she conducted her work. Examples of her efforts include the discovery of the high oleic acid soybean oil trait, the high-energy meal trait, and the combination of those traits into soybeans adapted to all major US soybean production environments using molecular breeding. ‘I hope I have showed you some of what molecular biology can do; that there’s a way that molecular biology can bridge that gap between basic and applied research. We can respond to challenges. We can create those tools, create the knowledge, create germplasm and assist people to utilise those things so that they can do better at what they need to do, and ultimately, that’s creating a safe and nutritious food supply for everyone,’ she said.